Make no mistake about it, getting your kids involved in golf will be one of the greatest and most valuable gifts you will ever give them! 1. Anyone Can Play: Golfers come in all shapes and sizes. You don’t have to be particularly strong, tall, lean or fast to succeed. Golf champions come in every shape and size imaginable. It’s never too early to start, and unlike most other sports you can enjoy golf your entire life! 2. Minimal Risk: Unlike many other popular sports like baseball, soccer and Football, the chances of injury, especially serious injury, are almost non- existent; golf is a non-contact sport. 3. Safe and positive environment: The golf course is a safe place to spend the day and often facilitates mentoring relationships with successful adults. 4. Lifelong friendships: You never know who you will meet on a golf course, but it’s one of the easiest place in the world to make friends. Success breeds success and people who play golf are by in large more successful than the average bear. Those are the people you want your kids hanging out with! Best of all, golf creates a unique bond so those friendships can be developed all over the world and last a lifetime! 5. Prepare for business: It’s hard to think about it now but kids grow up and the people they meet as children can play a huge part in their success later in life. Golf is a sport that helps prepare kids and teens for careers in the business world. Even at 12 I was learning about real life business every day from all the adults I played with. 6. Time Spent Outdoors: In today’s world of video games, smart phones and child obesity, it can be hard to drag your son or daughter off the couch. Golf is the perfect excuse to spend an entire day enjoying nature and presents the opportunity to develop healthy lifelong exercise habits! 7. Important Life Lessons: Golf is a sport that will teach your child life changing traits like integrity, discipline, persistence and respect. As they learn to conduct themselves on the golf course, these lessons will translate directly into everyday life. 8. College Scholarships: Avid golfers have a lot of opportunities when it comes to college funding. The earlier your child starts, the greater his or her chance is of gaining access to scholarship money. 9. 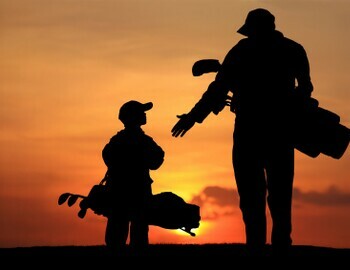 Spend time with family: Golf is a game that can be enjoyed by the entire family from young to old. When children are young, they enjoy doing just about anything with you (but it doesn’t long last so start now). Golf is an opportunity for quality bonding time and it’s one that can last a lifetime. 10. It’s FUN: This should probably be at the top of the list, but one of the best reasons to get your son or daughter involved with golf is that they’ll have an absolute blast. They’ll have the chance to learn new skills both physical and mental, make new friends and discover new opportunities. There are a million things you can buy or gift your kids in the hope that it helps them learn and grow, only a few make a real impact. Encouraging them to play golf is one!